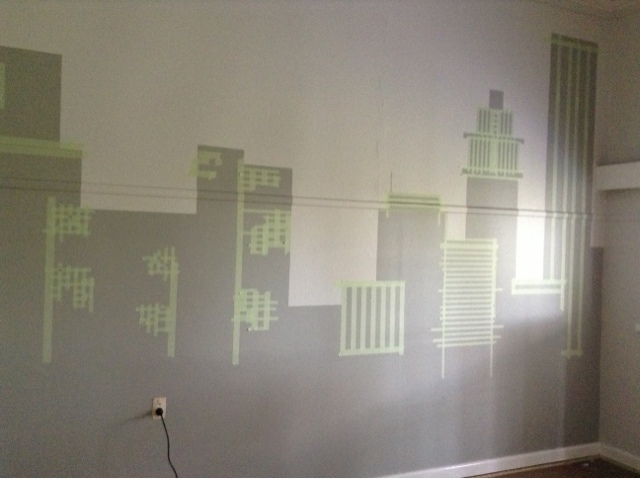 Ben's Walls Finished: Part Two! 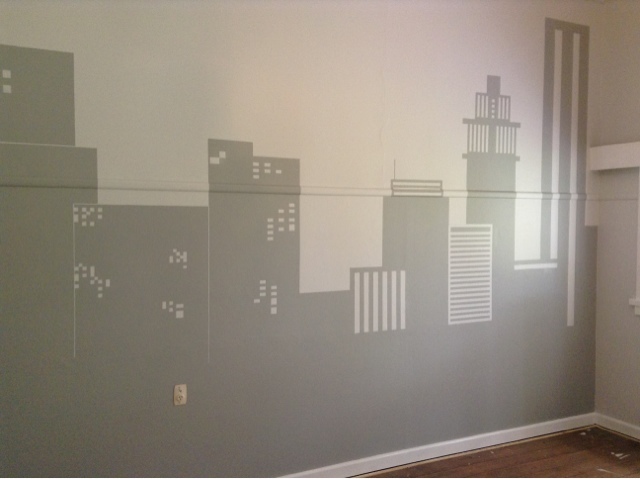 The city scape is finally finished! Really happy with the finished result and Ben can't wait to move into the city ;) In Part One, the building outlines were finished and Part Two was all about adding windows and details back in with the lighter colour. This lighter colour i am using for the windows is the same as the base colour I used to initially paint the top of the walls with. For this part you need painters tape, I used three different widths, and a spirit level that will become your best friend during this process ... nothing worse than having wonky windows when you have gone to this much effort! I went for a skyline like you would see at night, so the big prestigious buildings would have their light effects on and the little buildings would have windows dotted about with lights on from some hard workers still at the grindstone! 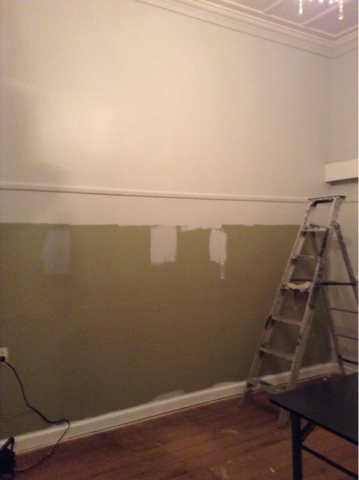 I have spen the last few days painting up a storm ... sometimes it feels like EVERYTHING needs painting and to be honest when you start any major renovations, it can be a tad overwhelming to pit it mildly. 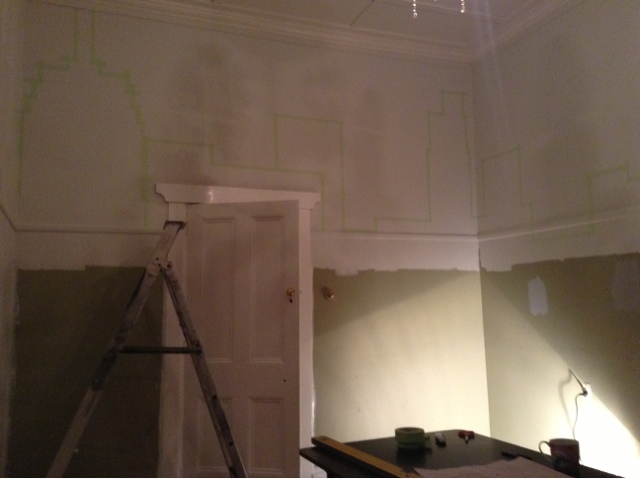 At the moment we have a builder putting up walls, and electricians making the house safe redoing all the old and unsafe wiring. It feels full on and I am trying hard to work around them and make progress with lots of painting so I can get on to the fun stuff! 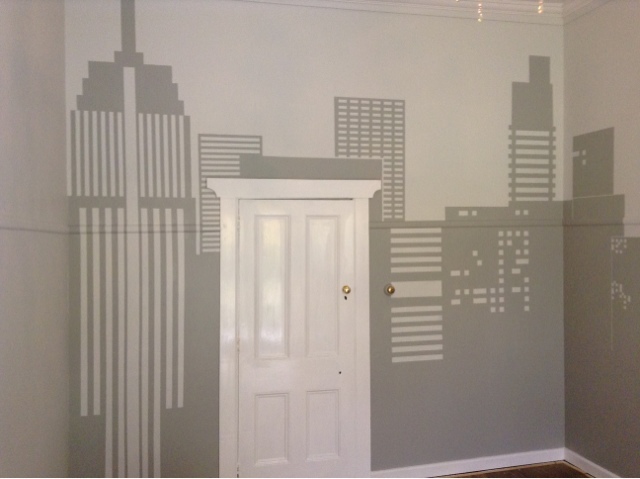 While I was looking at wall murals I found heaps of wall decals of city scape silhouettes, very cool but again far to small for what I was imagining. 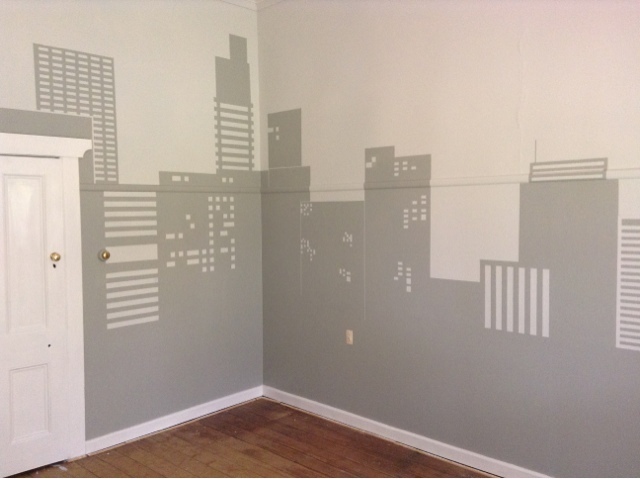 But it did get me thinking, I could make my own using two shades of paint, painters tape, a level, and the help of a handy dandy husband who isn't as afraid of heights as you are. 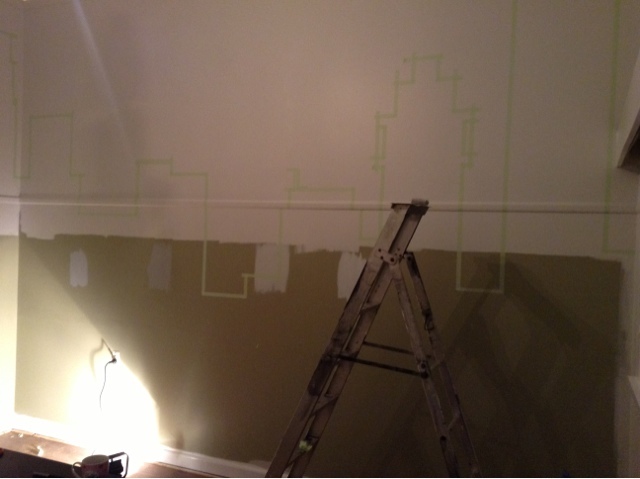 To start this adventure we painted the top half of the walls with the background light colour. 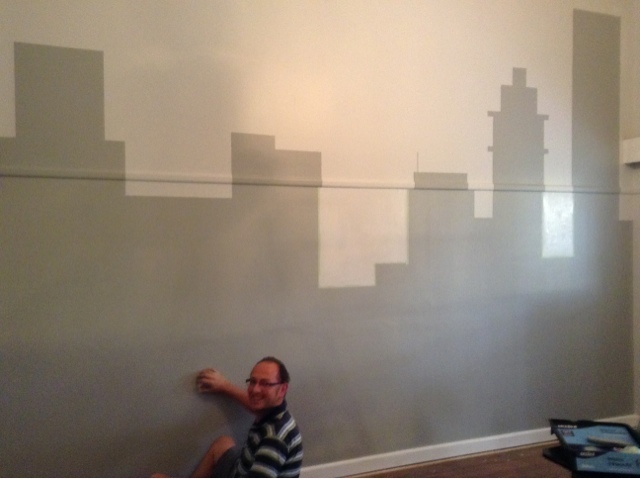 This way you don't waste paint on the lower half that is going to be mostly your darker colour. 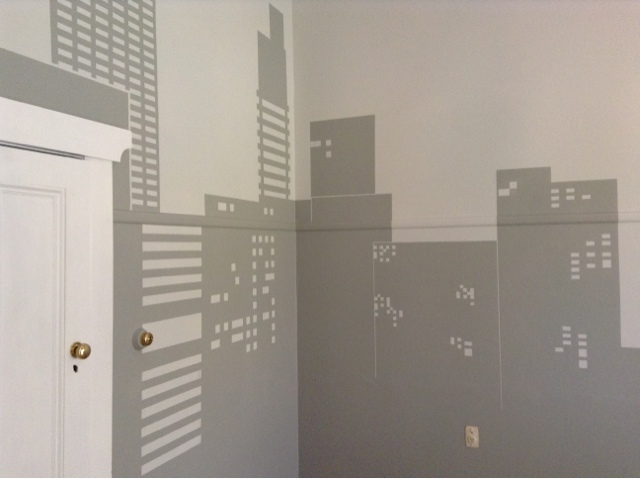 The silhouette is only going on two walls, all four would be too much, not a fan of a feature wall so two became the logical choice! 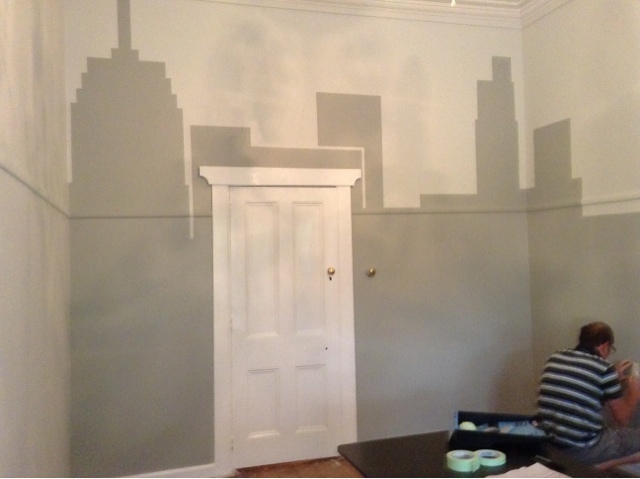 Once the lighter shade is painted you can get jiggy and create a skyline out of painters tape. 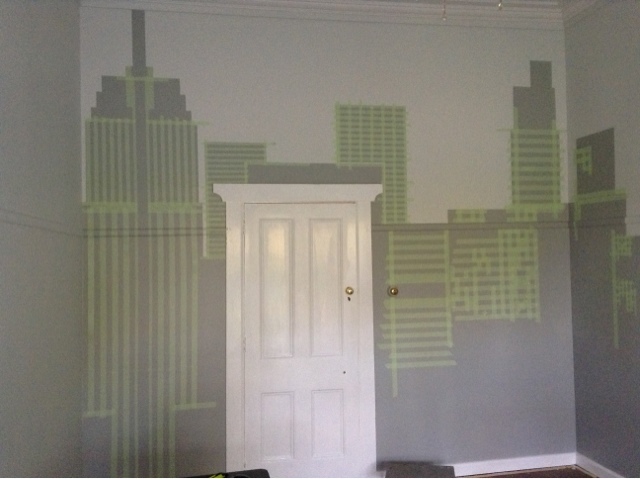 This initial taping is only the outline of the buildings, windows and details will happen tomorrow in Part Two. 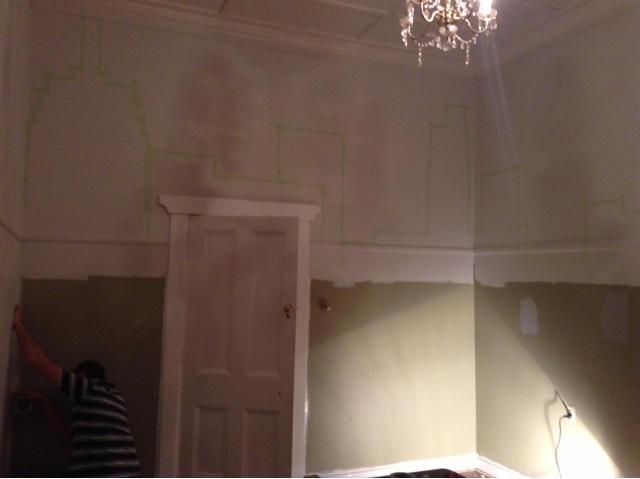 Once the taping was done, the underside of all the painters tape was painted out in our darker shade. 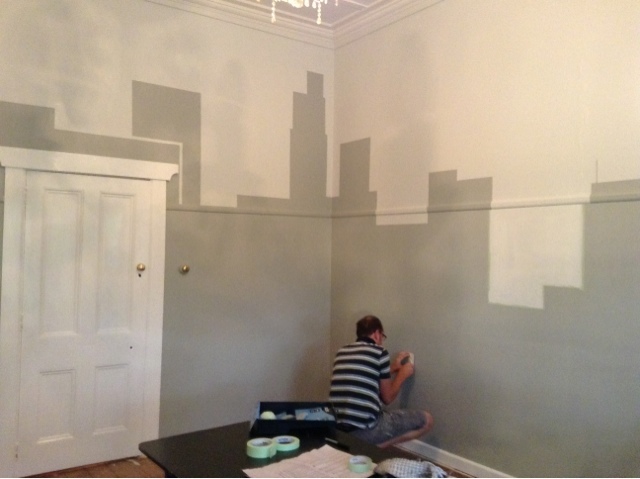 I chose two greys for this project, the dark shade is four times the tint of the lighter shade. Photos below of the process, sorry they are so terrible it was late at night and the light was foul so it was the best i could get. Waited until this morning to take the next lot so hopefully they are a little clearer! Next stop windows and details!